Professor Tim Briggs, GIRFT chair and NHSI’s National Director for Care Quality and Efficiency, formally opened new side rooms at St Michael’s Hospital in Hayle last week as Royal Cornwall Hospitals NHS Trust transfers its planned in-patient orthopaedic surgery from the Treliske Hospital site as part of GIRFT’s Hot and Cold Site (HCS) pilot. GIRFT is piloting hot and cold sites for trauma and orthopaedics in six hospital trusts across the country. The object is to separate elective (cold) and trauma (hot) on to two separate sites where geographically possible, to help to tackle patient delays for routine orthopaedic surgery by reducing last minute cancellations due to beds being required for emergency patients. The plans will also release capacity at the Royal Cornwall Hospital site in Truro for emergency patients and bring down length of stay. The Royal Cornwall Hospitals NHS Trust volunteered to pilot the scheme and was chosen due to the size of the patient benefits that can be achieved. Since the pilot began, the trust says it has already made progress in reducing the number of patients waiting more than 12 months, down from 130 in April 2018 to 38 in December 2018, with the expectation of achieving zero by the end of March this year. 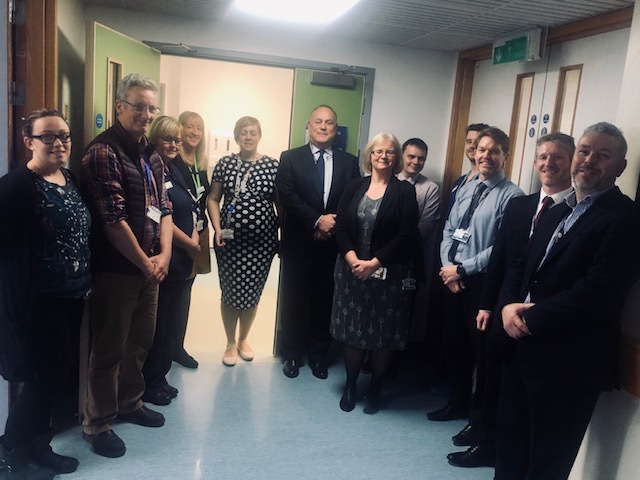 Royal Cornwall’s interim lead nurse, Shelley Jackson, said: “The other developments we’ve been able to make include the creation of a fully monitored higher care bay, a development of the pharmacy services on site and an increase in staffing. Professor Briggs added: “I am delighted to be asked to open these rooms, which will enable the hot and cold pilot to push ahead in Cornwall.